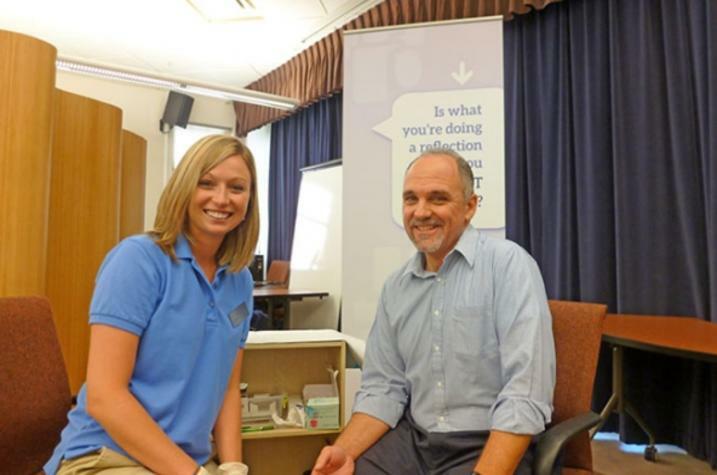 Melissa Collins, UK Health and Wellness adviser, visits with David Hibberd at a recent LiveWell Check In. LEXINGTON, Ky. (Aug. 27, 2018) —​ LiveWell Check In registration is now open for University of Kentucky employees. UK employees can once again participate in an integrative health screening, the UK LiveWell Check In. Appointments are available on and off campus Sept. 12 to Dec. 21. Eligible employees may schedule their appointment here. Employees who are on a UK health insurance plan can also receive a $100 rebate for participating. During this 20-minute Check In appointment with a HR Health and Wellness adviser, employees will receive an immediate and interactive snapshot of their health measures such as cholesterol, blood pressure, glucose and more. The Check In gives equal attention to the conversation-based portion of the screening where employees will be invited to "check in" with their sense of well-being. The Check In initiative launched in 2014 and is just one of the many ways HR Health and Wellness provides support to employees daily. Check In also serves to connect interested employees with free and highly discounted services designed to support their health and well-being. Log in to your UK LiveWell dashboard to explore these programs. Employees may attend an upcoming Check In event before, during or after their regular work shift. Those choosing to attend during a work shift should check with their supervisor in advance to minimize any potential disruption. As an alternative to scheduling a Check In appointment, you may submit recent health measures from your health care provider. Learn more about this opportunity on the HR Health and Wellness Check In website. Off-campus employees who work outside of Lexington will be able to attend Check In appointments during the spring semester.